The Bill of Materials provides you with an exact count of what devices and materials you have placed in your DraftLogic Electrical drawing—even those not directly represented by an AutoCAD entity. Your organization may call this schedule by a different name, like: BOM or materials take off. This report is useful for both budgeting the cost of the materials needed and for determining the labor needed to build the project. As with the other reports and schedules generated by DraftLogic Electrical, the Bill of Materials is generated completely automatically by the DraftLogic Electrical expert system software--all the outputs you see on this page & on the other reports samples pages are created without any designer intervention whatsover. DraftLogic Electrical never gets tired and sloppy, no matter how late he has to work! Your material counts as compiled by DraftLogic Electrical in the Bill of Materials will always be exact versus what you drafted into the floor plan. of the Bill of Materials report. Conduit, armored cable, nonmetallic dry cable, and wire are all totaled per size and type and reported as separate line items. When DraftLogic Electrical builds the Bill of Materials, detailed information is included about each panel and transformer. 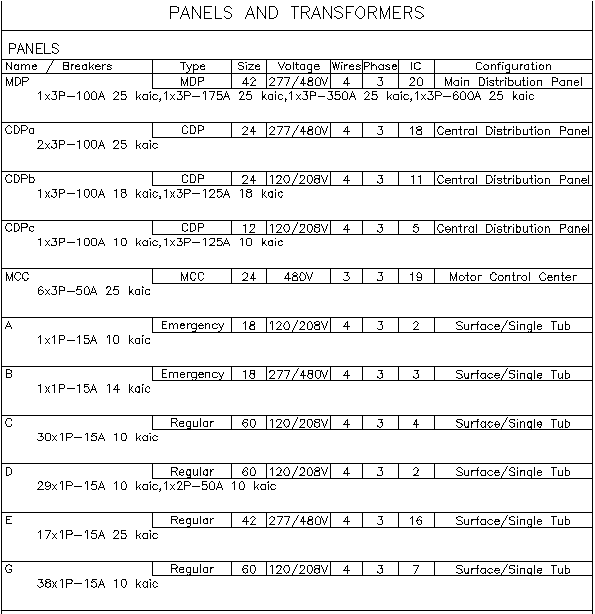 This includes a detailed list of the numbers, sizes, and interrupting capacity of each breaker on each panel. Above we see the Panels detail section of the Bill of Materials report. vital details about the devices listed. To assist with project pricing & materials ordering, DraftLogic Electrical includes a summary of all breakers used in the project and lists their quantities by each different protection and interrupting capacity rating. The Bill of Materials reports exactly what is in the floor plan in seconds. Never any devices, conduit, armored cable, non metallic dry cable, or wires missed, never any numbers transposed incorrectly. Other consultants on the project forcing you to make tiny changes seemingly hourly? No worries, the schedule takes almost no time to update. Rich in detail, the Bill of Materials will be perceived as high value by your client, increasing the perceived value of your services. The schedule that is created uses standard AutoCAD blocks. This means you can scale, rotate, copy & paste, move, modify any values, and even save the Bill of Materials out to its own DWG.